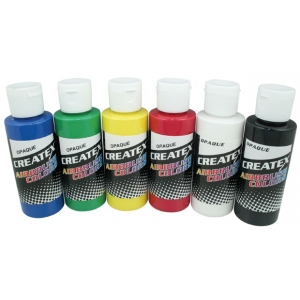 Createx Airbrush Colors are the number one most widely used and trusted professional airbrush paint in the world. 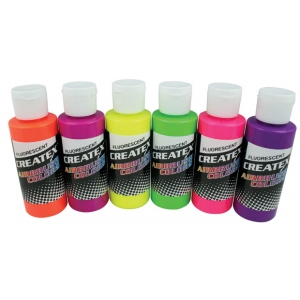 * Made with light-fast pigments durable resins and quality ingredients Createx works on fabric wood leather canvas plastics aluminum metals ceramic clay poster board brick plaster latex glass and more. * Colors are water-based non-toxic and meet ASTM D-4236 standards. 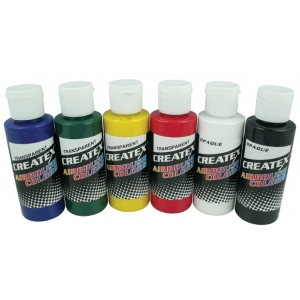 * Createx Airbrush Colors are designed for permanent results with a soft-hand feel on fabrics. * Colors cure with the assistance of heat after drying. 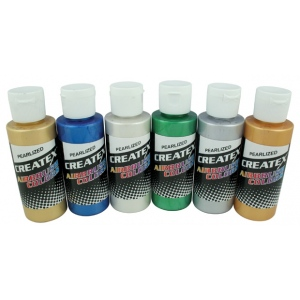 * The use of heat to cure colors is one of the main differences between Createx Airbrush Colors and Wicked & Auto Air Colors which cure to a much stronger film with air drying alone (referred to as self-cross linking). * Createx are made with exterior-grade (automotive) pigments allowing them to withstand prolonged exposure to direct outdoor light without fading. * For maximum permanence a top-coat should be applied over the paint after curing.